Skin irritants (such as detergents, personal care product allergens and fuels) can penetrate the skin and cause damage, local inflammation and irritation. Resultant damage of the skin can be described depending upon the type of damage: structural, chemical or biological. One such change in the skin which is apparent during irritation is increases in sub-epidermal blood flow, changes which can be assessed using laser Doppler monitors and imagers. Visual assessment of skin irritation via scoring of erythema is common but has the drawback of being very subjective; mild to moderate irritants may not result in the visual differences required for an erythema score. 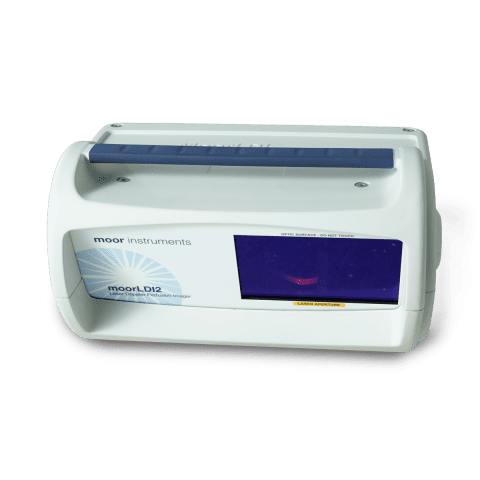 It is common for studies of skin irritation, patch testing, and allergy to rely upon individual (or a combination of) measurements including transepidermal water loss (TEWL), erythema scoring, histological assessment and skin blood flow. In particular, laser Doppler has been indicated when mild to moderate irritation is present when the irritation may not be visually apparent and where erythema scoring would not be sensitive. Image reproduced with kind permission of Professor Dorian Haskard, Imperial College, London. 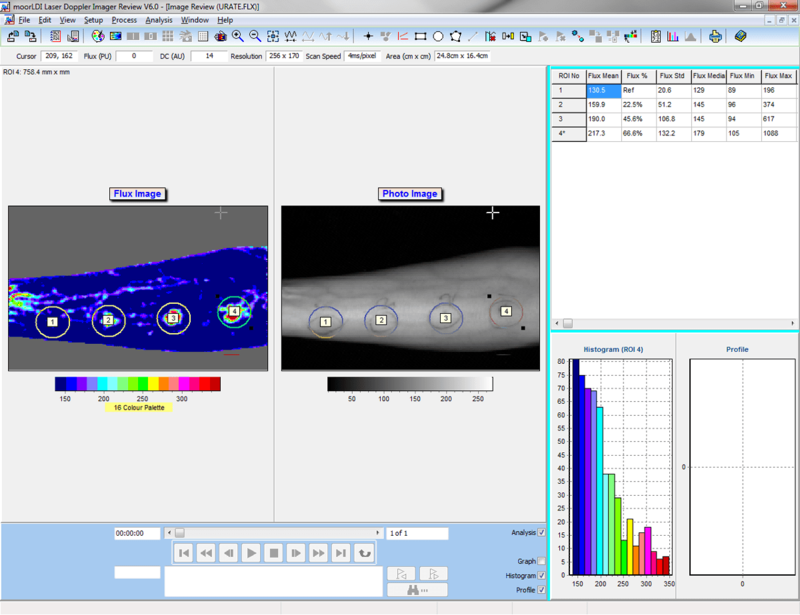 Although laser Doppler monitoring could be used, laser Doppler or laser speckle imaging would be a better option, providing a detailed ‘blood flow map’ of the area of interest and surrounding skin rather than a single point measurement. In this way, reproducibility of results is improved. 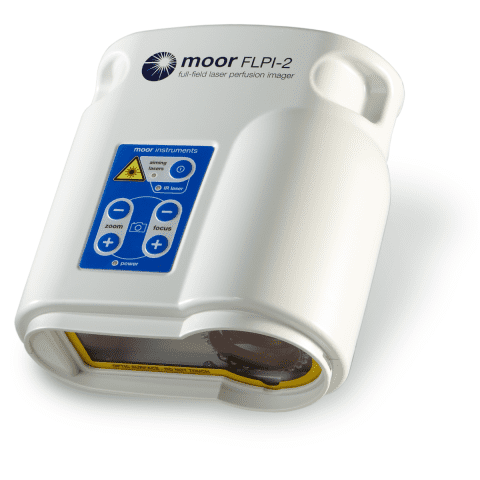 The moorLDI2-IR and moorFLPI-2 both enable the acquisition of subjective, quantitative data regarding skin blood flow over the entire area of the skin irritant challenge. Bal S. M., Caussin J., Pavel S., Bouwstra J. A. 2008. 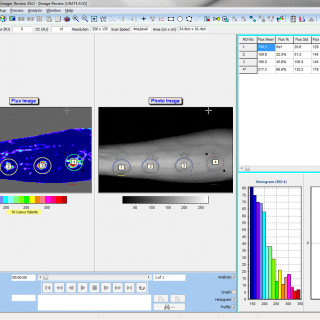 In vivo assessment of microneedle arrays in human skin. De Boer E. M., Bruynzeel D. P. 1996. Patch Tests: Evaluation by Instrumental Methods. Kanikkannan N., Locke B. R., Singh M. 2002. Effect of jet fuels on the skin morphology and irritation in hairless rats. Kanikkannan N., Singh M. 2002. Skin permeation enhancement effect and skin irritation of saturated fatty alcohols. Jibry N., Murdan S. 2004. In vivo investigation, in mice and man, into the irritation potential of novel amphiphilogels being studied as transdermal drug carriers. Saary J., Qureshi R., Palda V., DeKoven J., Pratt M., Skotnicki-Grant S., Holness L. 2005. A systematic review of contact dermatitis treatment and prevention.